Fundraisers are often overwhelmed with leftover items from rummage sales, flea markets, and White Elephant events. Historically, much of this unsold inventory has ended up at local thrift shops, benefiting other nonprofit organizations. Now, MissionFish and eBay offer an alternative solution for selling much appreciated donations. This exciting collaboration allows individuals, local community fundraisers, and nonprofit organizations an easy way to raise money online. In-kind contributions, obscure collectables and unsold auction items can be quickly and easily transferred into desperately needed funds. 1) Your supporters can list items on eBay Giving Works and donate a portion of the proceeds from anything that sells. 2) Your nonprofit can sell on eBay Giving Works  putting special event auctions online, or turning in-kind donations into cash. 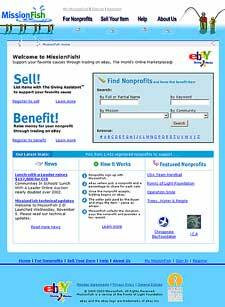 Independently, eBay and MissionFish have impressive histories of helping nonprofits, of all sizes, help themselves. Together theyve teamed up to offer Giving Works and The Giving Assistant, both trendsetting programs for fundraising. Buyers and sellers are given opportunities to support their favorite causes while trading on eBay. MissionFish provides nonprofit verification, donation collection and disbursement, tax receipting, and online contribution tracking. Its the combination of eBays formidable presence in the online marketplace and MissionFishs functional expertise within the philanthropic industry thats resulting in impressive returns for worthy causes. This union of buyers, sellers, nonprofits, and cause-marketers has been dubbed The Marketplace for Change; an altruistic tool by any other name would be hard pressed to prove itself more powerful. There are over 85 million eBay users currently and that number is going up constantly. Almost 1,800 nonprofits are register to potentially benefit from this enormous list of sellers. Shoppers are rewarded for purchasing items in the Marketplace for Change by having a portion of the money they spend donated to a worthy nonprofit. Sellers are given the opportunity to donate a portion of their sales to a pre-selected cause. Upside: 1) Satisfaction in making a difference and supporting positive change. 2) Assurance that your donation gets to the intended nonprofit. 3) A guarantee that the selected nonprofit is legitimate and in good standing. Downside: We havent found one. Additionally, those unable to offer significant cash donations can now offer their services in support of worthy causes. Legal, financial, business and other areas of expertise can be offered on eBay in support of nonprofit organizations. MissionFish has developed a way for these services to benefit worthy causes with cash donations and simultaneously reward donors with a well deserved tax break. Kristin Cunningham, senior manager of eBay Charity, reports, "To date, nonprofits have raised nearly $30 million on eBay, benefiting more than 500 charities in 2002 alone." She continues, "eBay is excited to be working with MissionFish to make it even easier for our community to give back to those in need." Sean Milliken, executive director of MissionFish says, "Since we started MissionFish, our nonprofit members have hoped that one day we would bring our solution, which they love, to a larger community like eBay. We are thrilled to have this opportunity to create and manage this tool for eBay so that nonprofits can have access to a whole new revenue stream for the important work they do." There are a lot of good people and companies that support nonprofits, and they have a lot of good stuff that they want to give away. Most nonprofits can't use the things that those people and companies want to give. Nonprofits don't generally have the time, the people or the infrastructure for dealing with in-kind gifts - even when they can use them. MissionFish operates under the umbrella of the Points of Light Foundation with its own distinct identity, an impressive roster of officers, and yes a passionate mission. Leaders behind this cutting edge charitable foundation have mastered the art of partnering with like-minded companies and individuals. MissionFish easily established the "mission" part of their moniker. "Fish," the second half of this impressive organizations name breathed new life into an insightful but overly familiar analogy. Bill Shore of Share Our Strength coined the phrase: "giving someone a fish feeds them for a day, teaching them to fish feeds them for a lifetime." MissionFish takes a bold step forward and endeavors to provide nonprofits with a way to build "fisheries," sustaining them perpetually. As a Fishery for nonprofit organizations, MissionFish provides a supportive environment for hatching funds and spawning a flow of revenue without significant financial expenditure or high-tech training. Sows Ears and White Elephants translate beyond Silk Purses and Cash Cows in the capable hands of MissionFish. The odds of success were favorable for MissionFishs original concept, but no one could have predicted the countless lives that have benefited from their efforts. Their initial launch was as an independent online auction sight allowing donors to offer anything of value to their choice of nonprofit through MissionFish. Items useful to individual organizations were kept; the rest were turned into cash through the auction marketplace. Benefits abounded for all parties involved. Shoppers enjoyed buying quality merchandise, sometimes hard to find items, while supporting charitable causes. Nonprofits translated unusable in-kind donations into desperately needed operating revenue and donors received tax deductions for their generous contributions. It took less than two years for the founders of MissionFish to radically alter their organizations governing structure and financial status. MissionFish began as a for-profit company serving nonprofits in October of 2000. During the course of operation, they recognized the potential for increasing their accomplishments by restructuring the organization as a nonprofit. MissionFish became a service of the Points of Light Foundation in the Summer of 2002. Like minded individuals joined in a mutual effort to "engage more people more effectively in volunteer community service to help solve serious social problems." The rest, as they say, is history. MissionFish launched "Lunch with a Leader Online Auction," a high-profile and unbelievably successful fundraiser. Political figures, business leaders and A-list celebrities offered bidders a chance to vie for lunch with individuals they admired. The now annual event attracts the likes of First Lady Laura Bush (who also served as Honorary Chair for the event), Arnold Schwarzeneggar, Richard Petty, Pattie Labelle and former First Lady Rosalyn Carter. Last years auction raised over $300,000 to benefit Communities In Schools. MissionFish has also managed blue-chip online charitable auctions like Ebids From The Heart benefiting the American Heart Association and online auctions for Sears, Roebuck and Co., The Oprah Winfrey Magazine "O," and Coors Brewing Company among others. its all true. In a few short years, MissionFish has done all this and more. In very short order, a few ripples in the fundraising pool have resulted in a tidal wave of revenue for charitable causes. Before our partnership with MissionFish, we generally considered an in-kind gift to be an unkind gift. MissionFish offers our organization a simple way to turn these donated goods into the revenue we need to reach the next child and the next community. It's the time of year when thoughts turn to giving-and figuring out what to do with those gifts you wish you hadn't been given. D.C.-based MissionFish understands. Think it's not worth donating that odd white elephant in your basement? Think again. The MissionFish auction helped us promote Sears merchandise online, and support the Points of Light Foundation at the same time. This is one of the only cash-free cause-marketing programs that I've ever found, and the results far exceeded our best hopes. Robert Wery, Senior Manager of Community Relations, Sears, Roebuck & Co. I have high praise for MissionFish. They helped us get our thrift stores online in a way that makes the most of our network and our national reach. Items we sold online for $75 would have been lucky to get a dollar in one of our stores.